Portulaca Happy Hour Mix is just perfect for summer this hardy ground cover loves the heat and is also drought tolerant! 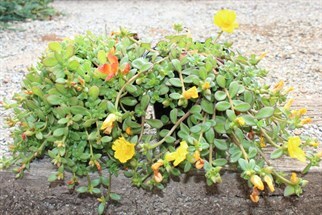 Portulaca, or moss rose, is a popular drought-tolerant annual. Plants are low-growing spreaders with thick succulent stems and vibrant, cup-shaped flowers. Flowers come in a wide range of colors. Portulacas love it hot and dry. You can plant them in poor, even sandy, soil.